Every body is different. Literally. Every person’s BODY is unique in their own ways. With different bodies come different goals... and different journeys to get there. While the general thought is that women exercise to lose body fat, that’s not the case for everyone. In fact, some women are naturally thin, so weight loss isn’t a goal. However, just because someone is already thin, doesn’t mean that exercise isn’t right for them. There are lots of benefits to exercise, even for those who are naturally thin. Low fitness levels, low muscle tone and decreased endurance are often byproducts for a naturally thin person who isn’t currently exercising. So, while we have established that exercising can increase fitness levels, increase muscle tone, increase endurance, improve cardiovascular (heart and lung) health… it’s important to outline what that looks like for someone who is already thin. Because, as we said... different bodies comes different goals and different journeys to achieve those goals. Naturally thin people do not need to spend a considerable amount of time doing cardiovascular exercise, since cardio burns calories for weight loss. Yet, integrating short cardio sessions into your routine will provide heart and lung health benefits. Additionally, long cardio sessions will yield muscle loss, which is an area that thin people typically need to GAIN in. Keep your cardio sessions to no more than 30 minutes around 3 - 4 days a week, with an intensity level of moderate to high. Choose an activity of your liking, because the odds of sticking to something are greater when we enjoy it! Next, let’s talk about weights. Strength training is an important component of fitness, and same holds true for thin people. Thin people who don’t exercise may have low muscle tone, so incorporating strength movements into your routine will help increase muscle mass. Don’t be afraid to lift heavier weights. Despite common fears, heavier weights will not yield bulky, masculine muscles. Uncertain of how much weight to use? Pick a weight that feels challenging - not impossible - to achieve 8-10 reps. Strive for 3 sets of this 8-10 rep range. Lighter weight and more reps is great to tone the muscle and increase endurance, but it will not actually grow the muscle. Strength training 2-3 days per week is a great goal. Make sure that your workouts each week include all major muscle groups: arms (biceps and triceps) chest, back, shoulders, legs, glutes, and core. Remember that proper form is key through all movements. If you find that your form suffers as a result of your selected weight, lower the weight a bit. Lastly, let’s talk about food. Fuel your body according to your goals. Thin people are thin because of their naturally high metabolism. So it’s important to ensure they are eating enough. Calorie deficits will not bring a thin person closer to their fitness goals. Just as someone who’s trying to lose weight will work to create a deficit of 500 calories per day (3,500 calories per week)…. the opposite applies for a thin person trying to grow muscle. Thin people should strive to eat a SURPLUS of 500 calories per day (3,500 calories per week). Equally important is the make-up of your food choices. Whether your goal is weight loss or weight gain, your caloric intake should be comprised of healthy carbs, fats, and proteins. If you’re looking to gain muscle, strive for .7 to 1g of protein for every pound you weigh. (Ex: If you weigh 110lbs, aim to consume 77 to 100 grams of protein) Protein is found in meats, fish, beans, lentils, eggs, nuts/seeds, and many other sources, so regardless of your dietary preferences (meat eater, vegetarian, vegan, etc).... There are plenty of sources to help you reach your goals! 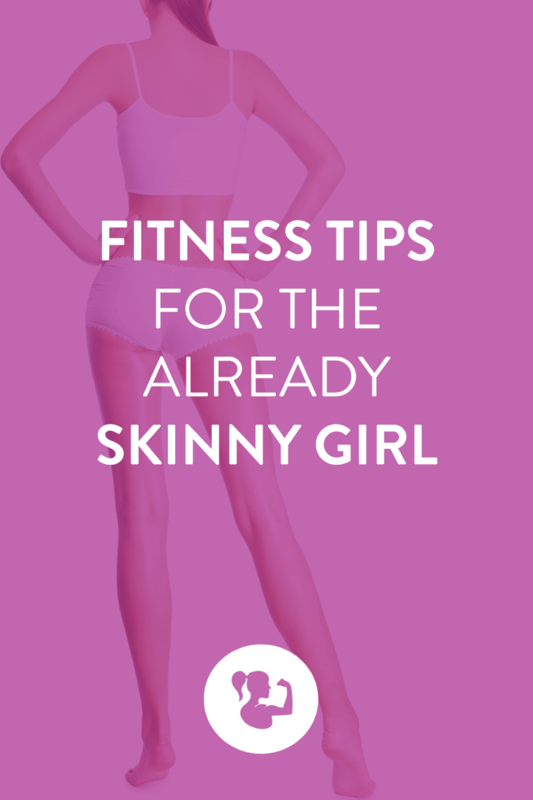 less cardio, more weights, and fueling your body properly will be the trifecta needed for an already skinny girl to make some strides in her fitness goals.